The Windrush Clinic is run by David Wilson and Sarah Bentley who are both committed to the well being of the patients visiting the clinic. He was the Program Leader for the Treatment and Differentiation of Disease at one of the largest colleges in the country, The College of Integrated Chinese Medicine. After lecturing , setting and marking exams for many years, he then became part of the team that developed the Herb course into an MSc in conjunction with Kingston University. Having set up the course he left to spend more time with patients in his private practice at the Windrush Clinic. 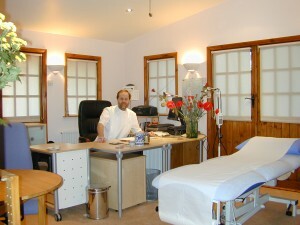 Licensed Acupuncturist and member of the British Acupuncture Council. Chinese Herbal Medicine practitioner and member of the Register of Chinese Herbal Medicine. Previous lecturer in Chinese Herbal Medicine Paediatrics at The College of Integrated Chinese Medicine (CICM) and was part of the team targeted with the development and writing of the Herb course at the college. Paediatrics training specialising in treating children. Specialist training courses in the treatment of skin disease over five years. Training in the treatment of Musculoskeletal Pain and Dysfunction at The Royal London Homeopathic Hospital NHS Trust with Dr A.Ward. Sarah has trained in all aspects of running a Chinese Herbal Pharmacy. The courses are run at the Chinese Herb Garden which is attached to the botanical gardens at Bristol University.